FILE - Chinese President Xi Jinping and Russian President Vladimir Putin are pictured at the Shanghai Cooperation Organization Summit in Qingdao in eastern China's Shandong province, June 10, 2018. U.S. President Donald Trump's apparent quest to kindle a bromance with Russian leader Vladimir Putin has made some Americans squirm. His performance in Helsinki, expressing confidence in Putin instead of U.S. intelligence agencies, ignited outrage across the political spectrum back home. Should Beijing worry that Trump could succeed in pulling Putin away from his relationship with China and its president, Xi Jinping? Probably not, political analysts say. Trump's charm offensive might cause Beijing a twinge of unease, given its tumultuous history with Moscow. But in this triangle, Putin and Xi are linked by strategic necessity, plus genuine personal affection. 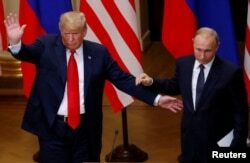 "Trump has made clear that he is a big fan of Putin,'' said Li Xin, director of the Russia center at the Shanghai Institute of Foreign Studies. China wants Russian oil and gas to power the world's second-largest economy. Moscow needs Chinese trade and investment more than ever following its estrangement from the West over its 2014 annexation of Crimea. "Both leaders seek to curtail American influence, weaken U.S. alliances and modify the international system so it is more favorable to them,'' Bonnie Glaser of the Center for Strategic and International Studies in Washington said in an email. FILE - U.S. President Donald Trump and Russian President Vladimir Putin react at the end of the joint news conference after their meeting in Helsinki, Finland, July 16, 2018. Trump raves about Putin's political skills, but the Chinese and Russian leaders have long enthused publicly about their unique rapport. "I've never established such relations or made such arrangements with any foreign colleague, but I did it with President Xi,'' Putin told Chinese state TV. As far as it is possible for global leaders to become real friends, they are "setting a pretty high bar,'' said Alexander Gabuev, a Sino-Russian relations expert at the Carnegie Moscow Center. "China has nothing to worry about,'' said Gabuev. Following the Helsinki summit, China's Foreign Ministry welcomed improved U.S.-Russian relations. A spokeswoman said Beijing was "full of confidence'' about its own ties with Moscow. "China-Russia relations will not be affected by any external factors,'' said Hua Chunying. 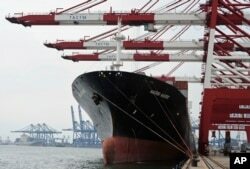 FILE - Containers are loaded onto a cargo ship at the Tianjin port in China, Aug. 5, 2010. A Brookings Institution analyst has said that if the U.S. doesn't take the lead "in writing the rules for the economy of East Asia, the Chinese will." "While we might rightly see Moscow as a rogue nation today, tomorrow it could be a partner in containing a common foe,'' Kazianis wrote this month in The American Conservative. That is unlikely anytime soon, experts say. Rather than view Trump as a rival for Russia's friendship, China is more likely to be pleased by the growing split between Trump and American allies in Europe.